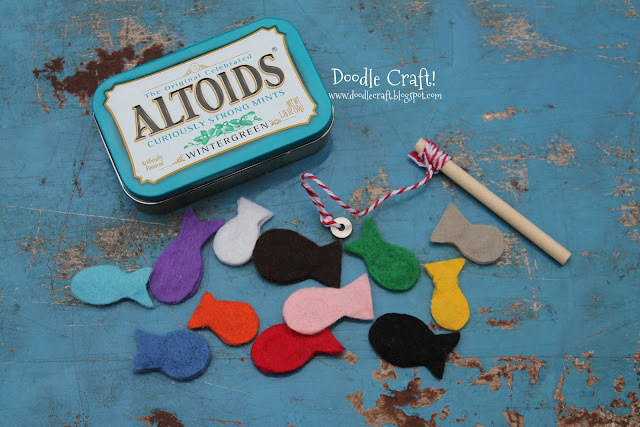 Doodlecraft: Shark Attack Magnetic Fishing Set! Shark Attack Magnetic Fishing Set! Shark week starts July 23rd, and there's no better way than to celebrate now! I'm doing shark themed crafts all week! This Shark fishing set is super fun for kids (and adults). I get to teach the 3-4 year olds in church. They are adorable and love to go "fishing". 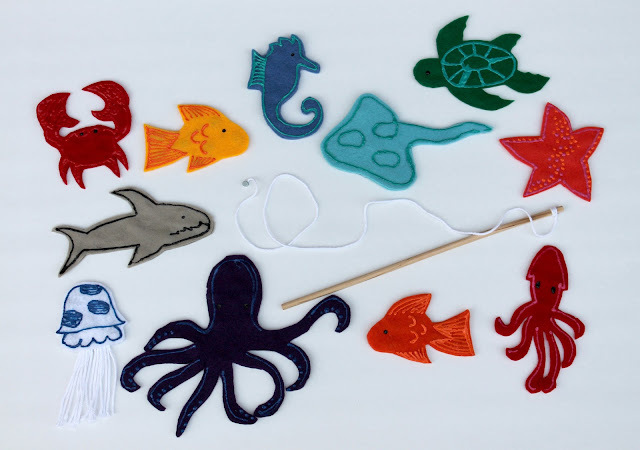 I bring this sea creature set every week and we have lots of fun! You know what though, I have 3 little boys in my class and it seems that the shark is the favorite to catch...it made me think...why not add some more sharks!? So, we've got a Great White Shark, a Sawfish (Saw-tooth Shark), a Hammerhead Shark and a Bull Shark. Right click to save off this handmade shark outline sheet. Cut the pattern into individual pieces. I made 2 of each shark type and cut them out at the same time. It's easiest if you staple the paper around the edges...this keeps the felt from slipping and makes it much easier to cut 4 layers at a time. I cut them out about 1/8 inch bigger than the pattern for 2 reasons. 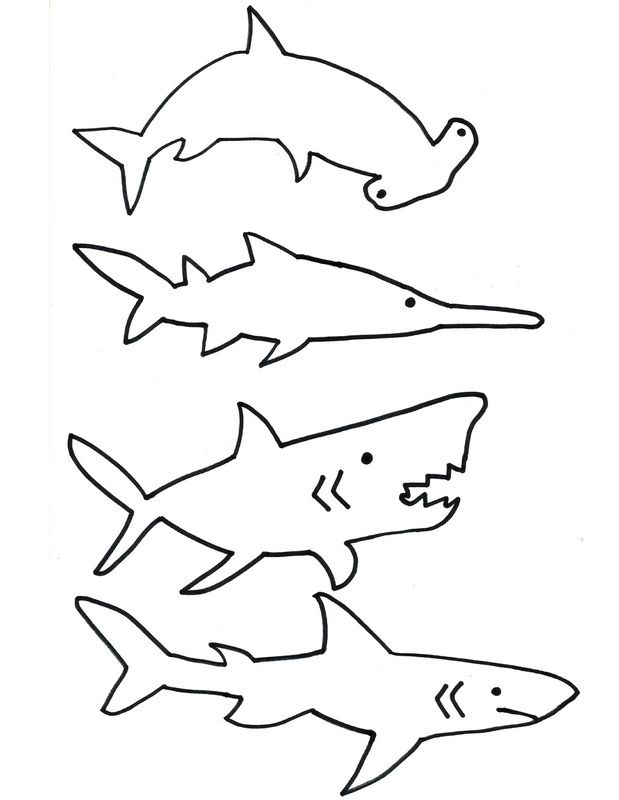 You will need 2 cut outs of each shark to make one piece. Cut them all out. Make them in any and every color! Next you will need the washers or metal disks. Make sure they are magnetic by touching the magnet to them. Now hot glue the washers/discs on one of the sharks. I did 3 discs each...one on the nose, middle and tail. You can decide how easy you want it to be caught by the amount of washers you glue on. Then outline the shark in hot glue. Press gently the other cut out on top. Press the layers of felt together, but be cautious, since the glue may seep out the layers. Next you'll need dimensional fabric paint. I love this Plaid brand because the tip is very delicate and precise. Use the paint and outline the sharks to give them fun features! Let them dry completely, at least 4 hours...then turn them over and draw on the other side as well. This way there is not a right or wrong side. Let them dry completely. Now tie the twine to the dowel and secure with hot glue. Tie the magnet on the end of the twine. My fishing pole dangles about 14 inches. Now you are ready to go Shark Fishing!!! Just place the fish in the "pond" and reel them in. Super fun craft for birthday party games, carnivals, classrooms, church classes, and PERFECT for SHARK WEEK! Come back each day this week for a new shark craft! Or maybe you'd like a mini fishing kit for on the go!